Get the kids in the kitchen with this simple fun twist on hard-boiled eggs. Substitute carrot sticks for the pretzels. Cut a small x in the larger end of each egg; insert a thin bread or pretzel stick, being careful not to split the egg. 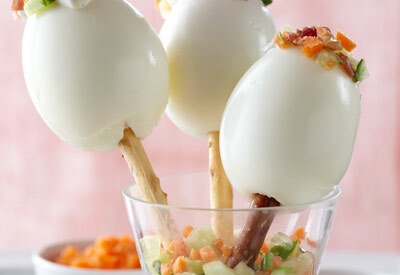 Serve the egg pops with your choice of dip and favorite toppers. Hard-boiled, not hard-boiled. Although the cooking water must come to a full boil in this method, the pan is immediately removed from the heat so that the eggs cook gently in the hot water. This produces tender, not rubbery, eggs and minimizes cracking. Banish the greenish ring. This harmless but unsightly discoloration that sometimes forms around hard-boiled yolks results from a reaction between sulfur in the egg white and iron in the yolk. It occurs when eggs have been cooked for too long or at too high a temperature. Our method of cooking eggs in hot, not boiling, water, then cooling immediately minimizes this. High altitude cooking: It's almost impossible to hard-cook eggs above 10,000 feet.